Oxenstierna (US: /ˈʊksənˌʃɛərnɑː, -nə, ˈɒksənˌʃɛərnə/, Swedish: [²ʊksɛnˌɧæːɳa]) is an ancient Swedish noble family, originally from Småland in southern Sweden, and can be traced up to the middle of the 14th century. The Oxenstierna family held vast estates in Södermanland and Uppland during the late middle ages and renaissance. In the 15th century, the family at times held the position of Regent of Sweden during the turbulent civil wars of the Kalmar Union. The family began to adopt its armorial designation of Oxenstierna as a personal name towards the end of the 16th century. In the case of earlier members of the family, the name has been applied by later historians. Several members of the family, notably the influential Lord High Chancellor Axel Oxenstierna, rose to prominence, high political office and titles during the age of the Swedish Empire in the 17th century. The only male-line branch still in existence today is Oxenstierna af Korsholm och Wasa, the comital branch descended from Gabriel Bengtsson Oxenstierna, 1st Count of Korsholm and Vasa (1586–1656). Other branches of the family, such as Oxenstierna af Croneborg, Oxenstierna af Eka och Lindö, and Oxenstierna af Södermöre, are now extinct in the male line. Great seal of Jöns Bengtsson Oxenstierna (1417–1467), Archbishop of Uppsala and Regent of Sweden. Jöns Bengtsson (Oxenstierna) the Elder, (?–1399), knight. Bengt Jönsson Oxenstierna, (1390s–1450), statesman, Privy Councillor and Lawspeaker of Uppland, Co-regent of Sweden. Nils Jönsson Oxenstierna, (1390s–1450s), statesman and Privy Councillor, Co-regent of Sweden, brother of Bengt Jönsson. Jöns Bengtsson Oxenstierna, (1417–1467), Archbishop of Uppsala, Privy Councillor, canon law scholar and statesman, Regent of Sweden, son of Bengt Jönsson. Kristiern Bengtsson (Oxenstierna) the Younger, (c. 1475–1520), Privy Councillor, executed during the Stockholm Bloodbath. Gabriel Kristiernsson Oxenstierna (c. 1500–1585), Baron, Privy Councillor, Admiral and Lord Lieutenant of Estonia. Gustaf Gabrielsson (Oxenstierna) (1551–1597), Privy Councillor, Lord Lieutenant of Estonia, father of Axel Gustafsson. Axel Gustafsson Oxenstierna, 1st Count of Södermöre (1583–1654), influential statesman and Lord High Chancellor during the age of the Swedish Empire, head of the regency council and de facto regent during Queen Christina's minority. Axel Gustafsson Oxenstierna, (1583–1654), Swedish statesman and influential protestant leader during the Thirty Years' War. Gabriel Gustafsson Oxenstierna, (1587–1640), statesman and Lord High Steward of Sweden, brother of Axel Gustafsson. Gabriel Bengtsson Oxenstierna, 1st Count of Korsholm and Vasa (1586–1656), Lord High Admiral and Lord High Treasurer, 1st cousin of Axel Gustafsson. 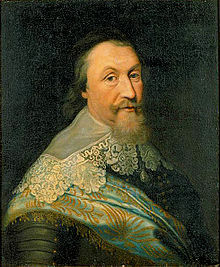 Bengt Oxenstierna, Count of Eka and Lindö (1591–1643), diplomat and Privy Councillor, Governor-General of Ingria and Livonia. Beata Oxenstierna (1591–1652), Mistress of the Robes to Queen Christina of Sweden. Johan Axelsson Oxenstierna, Count of Södermöre, (1611–1657), diplomat, Governor-General of Swedish Pomerania, Marshal of the Realm, son of Axel Gustafsson. Erik Axelsson Oxenstierna, Count of Södermöre (1624–1656), Lord High Chancellor of Sweden, Governor-General of Prussia, son of Axel Gustafsson. Bengt Gabrielsson Oxenstierna, Count of Korsholm and Vasa (1623–1702), President of the Royal Swedish Chancellery, Military Governor of Warsaw. Christiana Oxenstierna af Korsholm och Vasa (1661–1701), teacher and noblewoman, famous for marrying a non-noble vicar. Johan Gabriel Oxenstierna (1750–1818), poet, statesman and diplomat, member of the Swedish Academy. Johan Gabriel Oxenstierna (1899–1995), naval officer and pentathlete, Olympic gold medalist in modern pentathlon 1932. The Oxenstierna brought the blood of Agnes Haakonsdatter and Charles VIII of Sweden back into the throne of Denmark, Norway, and Sweden in the persons of Christian IX of Denmark and Haakon VII of Norway, and Carl XVI Gustaf of Sweden, the current monarch. All three monarchs today descends from the Oxenstierna through their common ancestor, Friedrich Wilhelm, Duke of Schleswig-Holstein-Sonderburg-Glücksburg, whose paternal grandmother was Countess Charlotte of Dohna-Schlobitten, great-great-granddaughter of Gabriel Bengtsson Oxenstierna, 1st Count of Korsholma and Vaasa, himself father of Bengt Gabrielsson the aforementioned and first cousin of Axel and Bengt Gustafssöner, as well as great-great-great-great-grandson of regent Bengt Jönsson the aforementioned. Oxenstierna was also the distant descendant of the aforementioned Charles VIII of Sweden and Agnes Hákonardottir. ^ "Oxenstierna". The American Heritage Dictionary of the English Language (5th ed.). Boston: Houghton Mifflin Harcourt. 2014. Retrieved April 16, 2019. ^ "Oxenstierna". Merriam-Webster Dictionary. Retrieved April 16, 2019. ^ "Ox-forehead"; stierna, in modern spelling "stjärna", has the double meaning of "star".